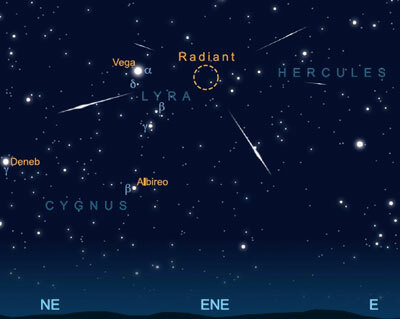 The spring meteor shower drought is broken with the arrival of the Lyrids, the shower peaking on the night of April 21-22. Every year the Earth passes through the trail of dusty debris left by the comet 1861 G1 Thatcher and usually produces in the region of 15-20 meteors per hour close to their maximum. Their name comes from the region of sky where the meteors appear to come from, the radiant, which lies about ten degrees south-west of brilliant Vega, the luminary of Lyra. Lyrids are well-known for producing fast meteors (the incoming meteoroids hit the upper atmosphere at 49 kilometres per second) and the numerous brighter shower members often leave behind lingering ionisation trains; the odd fireball too if we are lucky. This weekend's display is a favourable one as the Moon is new on the same night. Watches can start at about 11.30pm with the radiant about 30 degrees up in the east-north-east. Observed rates should improve as the radiant rises higher and by the time the morning twilight starts to lighten the sky at around 4.30am, the radiant will close to 70 degrees up in the south. Observers need to wrap up warm sitting back in a deckchair or recliner and look some 30-40 degrees in angular distance from the radiant at an elevation of 50 degrees above the horizon. It's just a case of counting how many meteors you see in perhaps a one to two hour session. It's often more fun observing in group when more information can be recorded, including estimates of individual meteor's brightness and the occurrence of lingering ionisation trains. Photographing the shower can bear fruit too; brighter meteors can be recorded by taking undriven time exposures with wide field lenses.